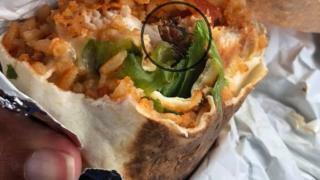 A "disgusted" customer claims she bit into her KFC Zinger burrito to find a cockroach inside. Bjourdashe Alio Henry bought her lunch from the fast food giant's outlet at the White Lion Retail Park, Dunstable. She said she was "on the verge of biting into" the unwanted filling when she realised what it was. KFC apologised and said: "When dealing with fresh, natural produce, things like this can sometimes unfortunately happen". Miss Henry, 25, who started to eat the wrap back at work, said: "I felt disgusted, I thought I was going to throw up as soon as I saw it. "I just threw it on the table and drove straight back to KFC. "I just had a hunch that something was wrong, as it didn't taste right. Once she returned to KFC, Ms Henry said staff insisted the item was not a cockroach but "couldn't give...an answer to what it was". They then gave her a £6 refund and kept the burrito, she said. An online complaint has been sent to the company, but Ms Henry has yet to hear back about the incident on 5 September. "We're sorry for Bjourdashe's experience and the team immediately offered her another meal when they heard about this."